Behind him in sixth was Christy Kimmage, father of future Tour De France rider and leading journalist Paul. And way back, clinging on to a friend on a service motorcycle, was a man whose name would become synonymous with the annual event and the sport of cycling itself — Gabriel ‘Gaybo’ Howard, from Stamullen, Co Meath. So began a lifelong love affair; Howard, then just a kid, was a fixture at every Rás since. He would have ridden that first one, too, only for a broken collarbone sustained descending into Slane in the Meath Grand Prix, an occupational hazard in the toughest game. “All the services that time were done from motorbikes, you were holding onto wheels, sometimes your hands would be frozen to the wheels when somebody would puncture,” Howard, who tragically died as a result of a farm accident on February 9, would recall decades later. The following year, 1964, Howard’s father stumped up £15 — a not inconsiderable sum at the time — to cover his costs and after failing to secure a place on the Meath team, he rode for Derry and finished 19th overall. Not only was it a different era, Ireland — and cycling — in the 1960s was something almost from a different world. Riders mainly stayed in private houses, sharing baths when hot water was in short supply. Howard rode and finished 21 Rásanna in all. In 1965, he won a stage, the 117-mile trek from Monaghan to Birr and it was front-page news, the “18-year-old farm worker” mixing it with the best. Over the years, he finished third, fourth, and fifth in an era where cycling was one of the most popular sports in the country. “I don’t know whether I was good enough to win the Rás. You have to have luck and you have to have a good team behind you,” he stated modestly in a 2015 local radio interview. The Irish junior men's squad observing a minutes silence for Gabriel. This morning our junior men's squad observed a minute of silence in honour of Gaybo Howard, whose funeral is taking place today. Gaybo's passing will have an impact on cyclists right across our community, having dedicated his life to cycling and promoting races. Nothing was too much. In 1975, he got injured during the Rás and completed the final six days with a broken wrist. Where some would have put the feet up, though, he didn’t; he couldn’t. A prior commitment to a continuous 300-mile lone cycle to raise funds for a local community hall had to be fulfilled. Wearing a cast on his arm, he completed it, coming in 20 minutes ahead of schedule. The Drogheda Independent carried the story on its front page under the heading “Rás victim Gabriel is still a winner”. At the time, the 300-mile stint was thought to be a world record. His local paper also reported on an incident in 2001, when Gabriel and his wife Kay — who was always by his side — were involved in a road accident. Howard’s first concern after a collision which, it was reported, the couple were lucky to survive, was a poker classic they were organising that night to raise funds for Stamullen Cycling Club. At his peak, Howard was ranked among the top 10 contenders in an Irish Press preview of “the toughest Rás ever”. That was the year, to quote Patrick Kavanagh (who was born just 35 miles from Howard’s stomping ground) “of the Munich bother” — 1972. At the time, there were rival bodies in Irish cycling, north and south of the border. Howard was aligned to the NCA and was part of a dozen-strong delegation who staged a protest at the Olympic Games. Togged out in green, white and orange singlets and mounted on bikes, they handed out leaflets in three languages protesting at what they saw as Britain’s role in the partition of Irish sport. The protest, just two days after the terrorist atrocity which saw 11 Israeli athletes and coaches murdered, was frontpage news back home. It would be seven years before there was a detente of sorts; in time, Irish cycling would be fully unified and when he finally finished competing, Howard totally immersed himself in organising and promoting the sport — aside from horseracing (an ancestor had saddled the 1898 Irish Grand National winner, Porridge), cycling was everything. 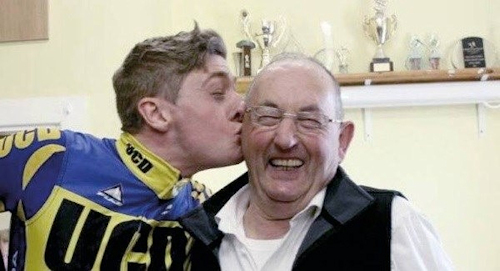 “He was part of a team, himself and his wife Kay, who were instrumental in cycling nationally and locally,” Eugene Moriarty, an international competitor and decorated Rás veteran, told the Irish Examiner from his home in the Netherlands. “I think the best word I could use to describe him is ‘capacity’. The man had an amazing capacity to give, whether it was to cycling, to family, to community, to everyone and it was constant and incessant. It didn’t matter if you were Sean Kelly or Stephen Roche or a rider who was maybe not as successful, he encouraged everybody. “He had a way about him, even if he was being critical, he did it in a very supportive and encouraging way. When the Irish Examiner spoke to friends and contemporaries of Howard’s, that same theme rang through — Gaybo and Kay were a team, a double act. “One of the really sad things about Gabriel’s death is his wife is as hard a worker in the sport as he was. I would love dearly if her input was still there eventually. They came as a pair, as a team and their dual input was incredible,” remarked Ger Campbell, secretary of the Drogheda Wheelers and a long-time friend of the Howards. “He was a larger than life character, always was. He did 21 consecutive Rás Tailteanns, that took him up to 1985. I suppose that was the end of an era as such but his best years in the sport were still in front of him because the one thing he did more than anyone else was give back. “From 1985, he did nothing only give back. He was passionate about the sport, he loved what he was doing but he was always there to give back, always.” That “giving back” came in the form of promoting, coaching, mentoring. He acted as MC for countless events and in the summer of 1998, when the Tour De France came to Ireland, he was the natural choice as a commentator, with a droll wit and huge presence. “I couldn’t say enough about him. He was great fun, he had a great turn of phrase and he was some man with a microphone at events. He was ever-present and effervescent too,” says Moriarty. When the news broke, it spread like ripples in a a pond and stunned the close-knit cycling fraternity. “There was just complete and utter shock and devastation. Gaybo was omnipresent, he was such a huge part of cycling and so popular,” said Heather Boyle, Cycling Ireland communications officer. Paul Kimmage was in the US when he discovered the dreadful news on Twitter. Gabriel was a unique man and a truly great servant of Irish cycling. My thoughts are with his darling wife, Kay, and to Siobhan, Seamus and Sinead. RIP. “The nature of it was shocking. I knew he’d had a couple of heart issues but to lose him like that just seemed too cruel. The sense of loss among the cycling community... I saw pictures of the boys along the road and I know how much they were hurt, you could see it in the photographs,” said Kimmage. As a teen, Kimmage had raced against Howard. In later years, they were neighbours. “The first time I ever heard of Cheltenham was through Gabriel, it was March 17 and we were riding a race in north county Dublin and he wanted to get finished to go back and watch a race at Cheltenham. He loved horseracing as well. “The cycling community in Ireland is a very small community and it’s held together by key people and without them, the thing could collapse. Off the top of my head I can only think of maybe four, and Gabriel Howard was one of those lynchpins. Online, where there are a number of popular cycling message boards and hubs, the reaction was similar — an outpouring of grief. “Devastated to hear about Gabriel Howard passing away. 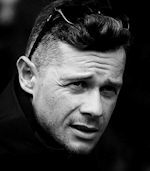 A true legend of Irish cycling and a great friend,” tweeted Nicolas Roche. Devastated to hear about Gabriel Howard passing away. A true legend of irish cycling and a great friend . My condolence and support to the familly... RIP. “There was something comforting about seeing and hearing Gay at races,” chimed in one contributor on boards.ie. The turnout at his funeral was such that, fittingly, gardaí closed the roads on the lead-in to town. Amid their grief, some of the onlookers smiled. Gaybo would have liked that.